This represents the best Open TT result of the season so far for any Hull Thursday rider. Jim covered the course in a 39:17, which narrowly missed the third place spot by only three seconds. Jim beat pre-race favourite Lee Cairns of Team Swift, who is an ex-international rider having secured many top six placings in Ghent and Holland, by nearly 2 minutes, as Lee clocked 41.09 for 6th place. Speaking exclusively to Hull Thursday’s website editor post event, Jim noted that he was disappointed with the forth place and felt he should have second place behind Richard Walker, the ‘in form’ rider of the moment, who had clocked 19.43 the day before in a blustery and wet Y.C.F. event on the V718. Richard had clocked a very impressive 37:29 over the narrow lanes that form this very unique event. Jim added that after analysing his power file for the race he had lost a bit of time in the middle sector, from a dip in power output. Jim added that time trialling is all about good pacing and if you come off the gas for a period mid-event you’ll never recover that time. 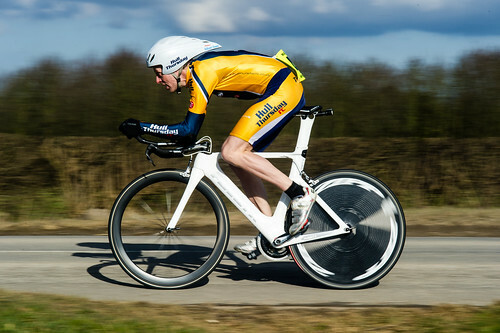 Jim ‘Hellenic Hawk’ Trevor in action in the Sledmere Monuments TT earlier this year.